Do not try to prove, to yourself or others, how strong your teeth are. That means avoiding chewing ice and other hard foods that could cause the enamel of the teeth to chip or even teeth to break. Look after your gums. If plaque is allowed to form on the teeth, gum soreness, swelling and bleeding will result. If the problem is allowed to persist, the underlying bone could also be damaged. 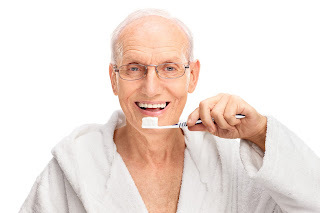 Among the common signs of gum problems are bleeding when the teeth are being brushed, gums that recede from the teeth, bad breath and loose or shaking teeth. If you have any of these or suspect that you are suffering from a gum problem, visit your dentist without delay. The longer you delay, the greater the chances of tooth loss. As a person ages, saliva production is reduced and there is a tendency for the mouth to become dry. Because saliva helps to clean teeth and protect against tooth decay, the chances of dental problem increase with a dry mouth, even if it is an intermittent problem. If you are on medication that could contribute to the problem – many medicines cause the mouth to go dry. To combat this, drink more water and when you do, hold it in the mouth for a few seconds before swallowing it. Sucking sugarless candy or chewing sugarless gum is another way to keep the mouth moist. Sodas and citrus fruits contain acids that can eat away at your teeth. If you do consume them follow up with cheese or milk to counter the acid effect. Avoid sugary snacks. Sugary foods should be eaten along with your meals. The extra saliva produced at this time will counter the acid that the sugar produces. The chances of cancer increase with age. Regular dental visits will allow for early detection of any symptoms so that treatment can begin quickly. The earlier treatment starts, the better the chances for good results. If you experience any unusual pain or sensitivity in the teeth or gums, consult your dentist immediately so that the cause can be located and treatment begum. If your teeth become painful when consuming anything hot or cold, it is usually a sign of worn enamel. Consult your dentist who may prescribe a special toothpaste or an in clinic treatment to cure the condition. Your teeth age with the rest of your body. Just as your body needs increased care and attention to continue to function optimally, so do your teeth. The best way to look after them is to visit your dentist regularly and follow his advice on caring for your teeth.